The Sawai Gandharva Sangeet Mahotsav is the most prominent and sought-after Indian classical music festival in India. Held in the city of Pune, this festival was founded by the Arya Sangeet Prasarak Mandal and is led and organized each year by Pt. Bhimsen Joshi. This festival commemorates the life and achievements of Pt. Sawai Gandharva. Such Hindustani masters as Smt. Hirabai Badodekar, Smt. Saraswati Rane, Ustad Ahmedjan Thirakwa, Pt. Kumar Gandharva, Smt. Kishori Amonkar, and of course, Pt. Bhimsen Joshi have graced the stage of this legendary festival. Many more maestros, young masters, and prodigies have performed at this festival in it’s fifty-five years of brilliance.. 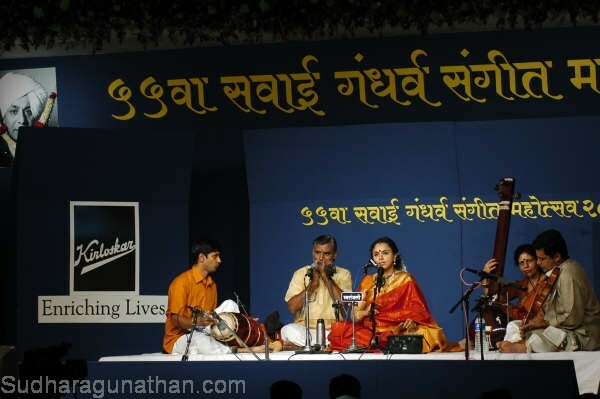 The 55th edition of Sawai Gandharva Music Festival was held at Pune during 6 – 10 December, 2007. Essentially known as a platform for Hindustani music, the festival did, at times, spring pleasant surprises by featuring Carnatic musicians. Stalwarts such as Shri.M.Balamuralikrishna, Shri.Mandolin Srinivas and Shri.K.J.Yesudas have also performed at this prestigious podium. This year, Sudha had the honor of featuring in the Carnatic music segment. The other musician who also performed in this segment was Shri L.Subramaniam. Prodding Sudha to speak about this festival was an onerous task as her modesty obliterated the vital aspects. Hence her colleagues Embar Kannan and Raman were approached for some insights into the festival. Raman commenced, saying that it was an elaborate and meticulous arrangement, as it took into consideration the entire gamut of artistes’ well being right from entry to exit, including adequate and appropriate introductions through audio visuals. It was with awe that he described their first sight on stage! On entry, as they went straight into the green room, they did not get a chance to see the audience, though they were given to understand that it was a large crowd. But they certainly were not prepared for the stunner that welcomed them. Heads and heads and only heads blobbing everywhere….it was an astounding number and must have been anywhere between 15000 and 20,000 in the audience! And a majority of them were only North Indians, which set this group wondering how their South Indian music would be received. Embar Kannan goes on to say that Sudha’s repertoire for the evening consisted of Daru Varnam Maathey, an elaboration of the Hamsadwani raga, Vaatapi Ganapatim and again an elaboration of Ritigowla. While all other ragas have a Hindustani counterpart, raga Ritigowla is unique. Sudha chose as the central piece, a Thyagaraja kriti in raga Pantuvarali, the intent being that the Hindustani music lovers would be able to assimilate this to Puriya Dhanashree. She did a great job in extolling it’s virtues, having the audience with her right from the word go! A great mix of quality in quantity, the audience were a very discerning lot. The applause sprinkled at the appropriate places, especially during the raga alapana and in swara korvai was evidence enough to endorse the stature of the audience! While the concert was scheduled to start at 5 pm, it commenced only at 6.10 pm. The time allotted was 75 minutes but however, it ran on to a 100 minutes purely on account of the audience response. The thani avartanam was well received and Raman was asked to explain elaborately on his playing instrument, the Morsingh, which elicited attentive listening. Sudha had some trepidation on singing Marathi in the land of the Marathas, which she expressed so in all humility, before singing an abhang. But the audience loved it and commented that she was indeed perfect and that she must sing many more. Paucity of time got the concert to a close, with a standing ovation. The audience seemed to have enjoyed the evening, but the artistes enjoyed it even more….to have sung and played for such a discerning, attentive and encouraging audience, many of them for whom listening to Carnatic music was perhaps the first time. They came up to Sudha after the concert and said to her that they wished it had lasted longer! The next in line to perform was Rahul Sharma, son of Pandit Shri.Shivkumar Sharma. The musicians were then taken to the Hall of Fame. As they manoeuvered their way, as though to say that the crowd was still with them, there was applause and cheering all along. A memorable moment indeed! The Hall of Fame housed photographs of all the artistes performing over the years. Smt. M.S.Subbalakshmi, Smt.Hema Malini and Kum.Alarmelvalli were amongst the South Indian artists, whose prominent positioning caught one’s eyes immediately. With Sudha performing this year, she was told by the organizers that during her next visit, she would find her portrait adorning the place! The artistes left Pune, touched by the hospitality, appreciative of the entire organizing and with lingering memories of the outstanding audience response. For Sudha, it was an endorsement of acceptance with open arms, another step forward for Carnatic music, to break into the realms of the Hindustani frontier and establish it’s own stronghold up north.